One out of every four of us will die while residing in a nursing home. For most of us, that stay in a nursing home will be brief, although this may depend upon social and demographic variables like our gender, net worth, and marital status. These are the conclusions of an important new study published in JAGS by Kelly and colleagues (many of whom are geripal contributors, including Alex Smith and Ken Covinsky). 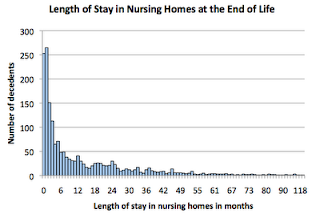 The study authors used data from the Health and Retirement Study (HRS) to describe the lengths of stay of older adults who resided in nursing homes at the end of life. What they found was that out of the 8,433 study participants who died between 1992 and 2006, 27.3% of resided in a nursing home prior to their death. Most of these patients (70%) actually died in the nursing home without being transferred to another setting like a hospital. nursing home residents in the highest quartile of net worth died six months sooner than those in the lowest quartile. I had a chance to talk with the lead author, Anne Kelly, about the implications of these findings. Kelly told me "that even though this study doesn’t address why certain demographic and social factors lead to a shorter length of stay, it does look like people with greater social support at home have shorter lengths of stay when admitted to a nursing home." Kelly also explains that the findings of this study reinforce the idea that advance care planning needs to occur upon admission to a nursing home. In her words: "it's best to begin those discussions early on and readdress them frequently during their stay given that so many people are going to be there for only a brief time." Their take home - "If you're going to put Grandma or Grandpa in a nursing home -- don't put off making a visit." End of life/Advanced Planning is part of every admission in the SNF and certainly part of every admission discuss I have with patients. As a former hospice nurse, now a GNP working in the SNF environment I am a strong advocate for good EOL care for my patients. I think the bigger issue is the problem with reimbursement issues for EOL care in this environment. Certainly those residents who are "custodial" residents can receive hospice services without being penalized, but skilled patients are penalized by switching from skilled to hospice services. The problem with that is that while I can ensure my patient is comfortable, symptoms are managed, I cannot access the wonderful services of the interdisciplinary team (social worker, chaplain, volunteers, etc.) and cannot access bereavement services for the family members. Queen Bee, I completely agree with the issue you raise. In my training I worked in a SNF and this issue of patients on the skilled benefit who were hospice appropriate came up ALL THE TIME. Like once a week (in a busy SNF). These pateints faced the choice of staying on the SNF benefit and having symptoms managed by facility staff but none of the other services hospice provides (social work, chaplain, volunteer) or switching to hospice and paying for room and board out of pocket (usually ~$300/day). Not suprisingly, most chose to stay on the SNF benefit. We need more palliative care options in SNF (more hospice like services) and changes to the hospice/SNF benefits to allow these patients access to hospice without penalty. This is a great article. Thank you for the clear and concise infomation. This will help us advise our clients for end of life planning. Sad to say but many of us abandoned our parents till they get old. A nursing home is a place where sick or old people, requiring attention and medical care, can stay. Thanks for the information. I don't want to die in a nursing home but rather I want stay in a retirement community after my retirement. According to the 2004 National Nursing Home Survey, nursing home residents who did not receive end-of-life (EOL) care had a mean length of time from admission of 837 days (median of 462 days), while residents who received EOL care had a mean length of time from admission of 761 days (median of 479 days). Most of us plan to live in nursing homes during old age. You've come up with interesting statistics.